Jerusalem is known for conflict, bombings, and terrorist activity not for peace. Yet God commands us to pray for the peace of Jerusalem. How and what are we to pray for peace in Jerusalem? 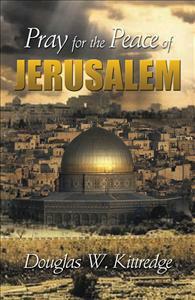 Jerusalem is notorious for its conflicts between Palestinians and Jews. First the bombings, then the security/separation wall, now knife attacks and automobiles intentionally killing Jewish pedestrians. In Psalm 122:6, God instructs us to pray for the peace of Jerusalem. Yet how many Christians follow God’s command? How are we to pray? What are we to pray for? Jesus wept over Jerusalem, grieving that the city did not know what would bring peace (Luke 19:41-42). The roots of the conflicts are spiritual and not political. “Pray for the Peace of Jerusalem” is a prayer guide to consider the issues that only the Gospel of Jesus the Messiah is able to address.